The skies cleared around 3am this morning allowing the overnight temp to drop to 21.8c, even the Nor-easter decided to take a well earned break around 6am after blowing its head off for the past 3 or 4 days, but it won't be long before its starts again. Like Steve777, I too was hoping for a nice sunrise but a thick cloud was way out on the eastern horizon. I think back in the day the papers used to be The Daily Mirror and The Telegraph which I think merged in the early 90s to become the Daily Telegraph?? The tone in here is refreshing! Dipole - amazing photos thank you! You and Eddy have it covered. Homer - yes. Threads need to encourage contributions and membership not undermine their own potential. CoastalStorm22 - I did the same!!!! I used to clip out daily snow reports during winter and compare the data in an exercise book, keep the synoptic charts and forecasts lol. Used to call in my rain and temp results from own my weather station to Win TV wollongong. Steve777 - going for another 30+ here but a 23 forecast tomorrow - importantly a 13 minimum! Starting to notice later sunrise now too. Flags on the bridge (Harbour and Glebe Island) are indicating a stiff NNW. Still as on the streets of the CBD. That annoying ribbon of cloud looks to be slowly shifting to the NE so we may get a sunny day eventually. Or it might just be my wishful thinking. Anyway, cloud clears, NW wind mixes down to ground and stays that way & late southerly. Could I dare hope the planets align and we sneak in a 40+ here? I am 62 and agree this is the most humid summer I can recall. 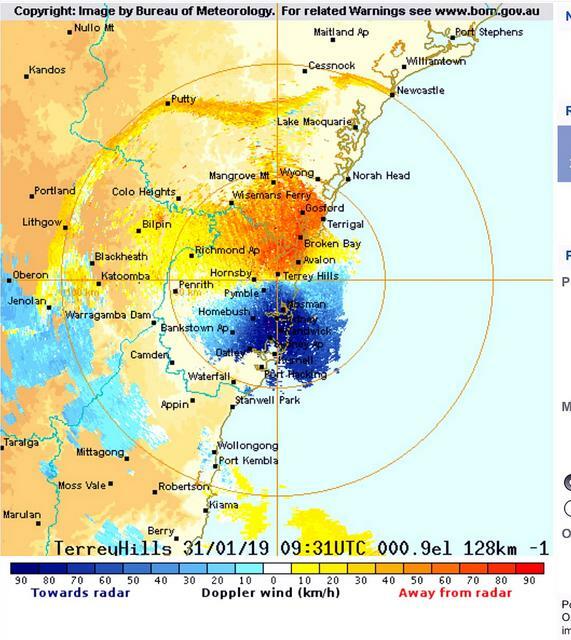 Lucky that I live 1.5km (straight line) from ocean, and just 200m from Lake Illawarra, which has keep most days sensible side of 30C, but only just. Late January into February 2011 was similar. It featured a record minimum, a 40+ and a run of 6 30+ for Sydney OH. It was also a cloudy month in spite of the heat, like this one. January 2019 has featured consistency of the heat and especially the humidity, but no near-records in Sydney. Minima: all but 2 over 20. Warmest 23.5, which is no big deal. - Two cool days (22 and a bit), the only two maxima under 25. - All but 3 days reached 26. - All but 6 days reached 27. P.S. the clearing edge is passing over here now and the Sun's out. Still hanging onto a NE wind here, around 30C, but humidity "only" 60%, normally this would be high enough. Bellmabi Point hanging on as the last stronghold of seabreeze on southern half of NSW. 11C difference in the 10-15kms between it and Albion Park. And Penrith is back again. Probably a brief visit for a coffee and a chat and then it'll be off again. Any thoughts on time of arrival in Sydney? Will I beat the change home? Here's a picture showing the change, a sharp line off cloud off the South Coast from just South of Ulladulla. 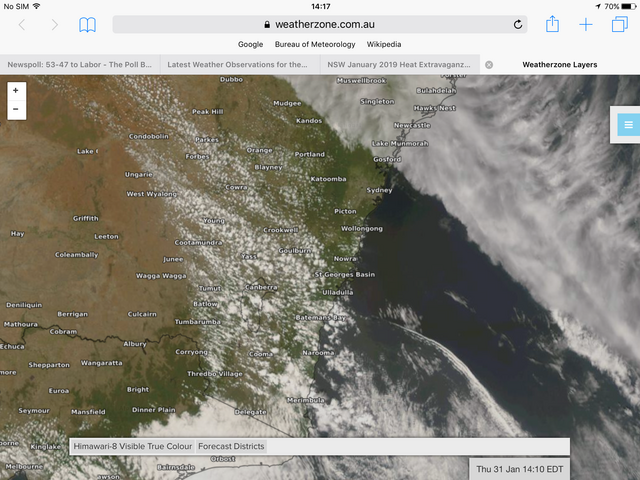 That NW-cloud band is still near Gosford. The change passed through Moruya about 12:50 and has yet to reach Ulladulla. They tend to speed up after Jervis Bay (when 3 hours from Sydney). My guess for Sydney would be around 6:30 - 7:30 PM. P.S. Penrith' back and closing in on 40. OH has been to 37.8 (100 F). I can see that clearing edge from here, but it's taking it's time to clear that's for sure. Temps are quite warm considering we are under cloud. I think that southerly will be quite sometime before it reaches here. Bloody frigid this morn...haven't felt quite like this in a while! Long live the southerly! It's dropped to below 20c, I couldn't help think this morning when it was 17c and drizzly that in a few months 17c will feel balmy once we get high pressure induced -1s and -3s most mornings in outer Sydney. It's below 20 at Sydney OH for the first time in 25 days. There's been a bit of rain overnight, 2 mm at Chatswood. We're in a different pattern now. Two days of solid overcast but not much rain (I don't believe the forecast maxima of 24,and 27). A bit of a warmup then a mixed bag, although there doesn't appear to be serious rain or serious heat in the next 10 days or so. Maybe storms. Ok you cold lovers have had your fun with this southerly buster, time for the heat to return. Nice screen shot Steve777, it was amazing watching the doppler in real time last night. We did dip below 20c last night only just 19.9c was my overnight low. The winds this morning have backed right off, under 10kmph for the last hour or so and must have been pretty strong at times last night as there is plenty of leaf and small branches down everywhere, my station only recorded a gust 48.3kmph though. Heat = anything over 20. Generated in 0.040 seconds in which 0.016 seconds were spent on a total of 14 queries. Zlib compression disabled.